ActivCreme moisturizes the skin and prevents premature skin aging. 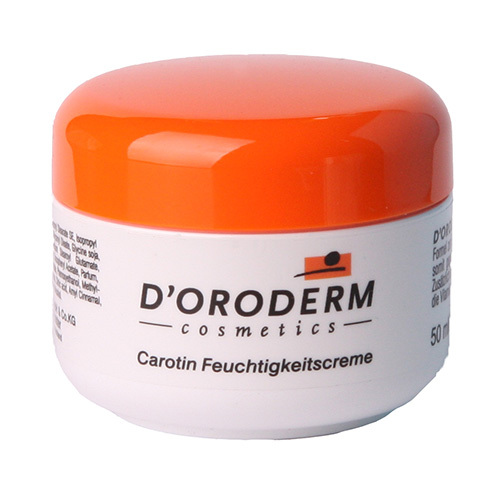 D´Oroderm Carotin ActivCreme’s anti-aging formula moisturizes the skin and prevents premature aging. It also contains valuable organic oils and vitamins A, E and F as antioxidants, as well as calendula extract, which has a long-lasting soothing effect on the skin. Ingredients: Aqua (Water), Propylene Glycol, Isopropyl Myristate, Glyceryl Stearate SE, Cetearyl Alcohol, Olus (Vegetable) Oil, Sorbitol, Decyl Oleate, Glyceryl Stearate, Glycine Soja (Soybean) Oil, Urea, Sodium Stearoyl Glutamate, Tocopherol, Calendula Officinalis Flower Extract, Glyceryl Linoleate, Parfum (Fragrance), Tocopheryl Acetate, Retinyl Palmitate, Helianthus Annuus (Sunflower) Seed Oil, Beta-Carotene, Ethylhexylglycerin, Glyceryl Linolenate, Ascorbyl Palmitate, Lecithin, Hydrogenated Palm Glycerides Citrate, Phenoxyethanol, Benzyl Alcohol, Citric Acid, Amyl Cinnamal, Cinnamyl Alcohol, Linalool, Hydroxycitronellal.